A smooth tapered wedge of tinted milk to gem grade lavender rose quartz, this California rough is nearly see-through. 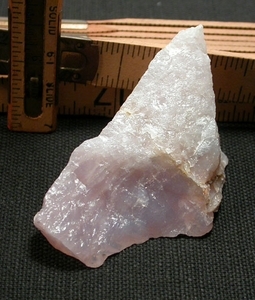 Lithium inclusion turns 'regular' rose quartz lavender, and this 1x 2x 3" specimen is a fine example. Cabinet sized for your collection, neatly portable size for metaphysical balancing on the go.